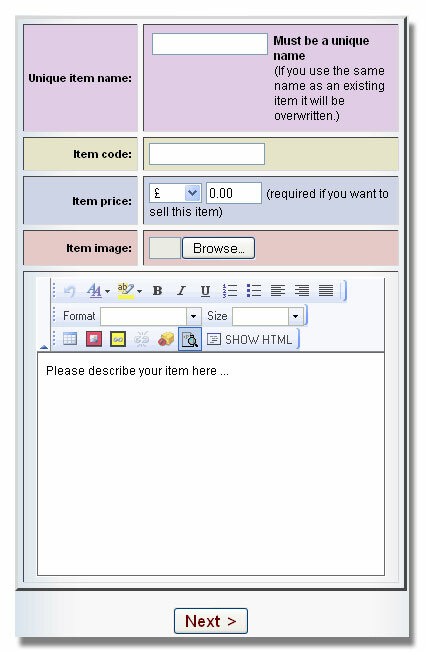 Step 4 in the website editor is responsible for the inputting and categorisation of your products or ITEMS. Click Step4 and follow the entry wizard. One-by-one you will enter your items into a database that is organised into categories, or GROUPS. Eg if you were selling clothes then your groups might be shoes, dresses, shirts etc. Each item you enter must have a unique name, image, price, code and description. You can easily edit your items and switch them between groups and setup options such as different colours and sizes, bulk discounts and related items to be sold together. Your website will display each item on its own professional page, with the information you entered laid out alongside a perfectly sized image. Once you have entered your items, you can consider your website structure. You need to create a user journey that will take your customers to the products they want. The yellow hyperlink icon can help you create links to the group and item pages. Click the shopping basket button on the left and switch on your basket. This single click will add a shopping basket to each of your items. You will then be sent two emails. These show you how to initialise your basket and make configuration changes. To add paypal, just login to your shopping basket (following the instructions in the emails) and add the email address that you use with your Paypal account and the shopping basket will do the rest. It is a good idea to thoroughly test your new shop. Make sure that everything works as expected. We recommend creating a low cost item for about 10p and then asking friends and family to purchase through their own PayPal accounts.